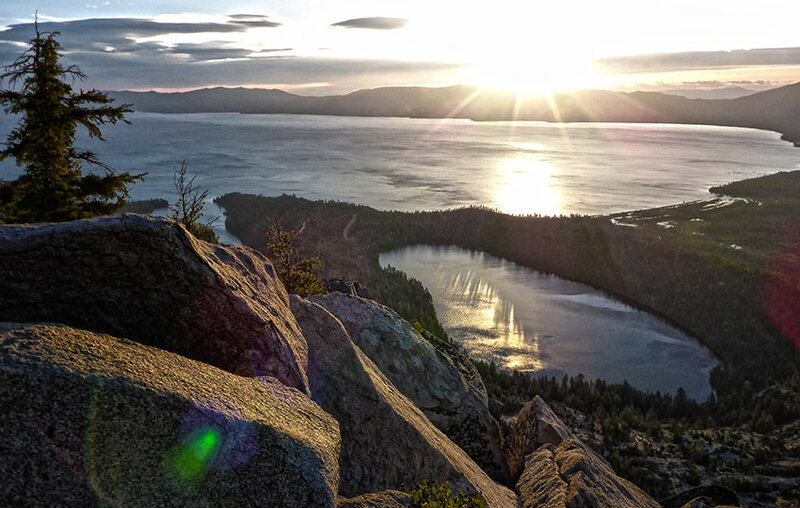 The day hike to the south peak of Maggie’s Peaks is an incredibly worthwhile challenge that rewards you with countless panoramic views of the Lake Tahoe Basin. 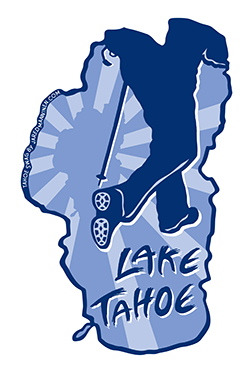 In addition to long views along Lake Tahoe’s east and south shores, you will also see Emerald Bay, Cascade Lake, Fallen Leaf Lake, Freel Peak, Mount Tallac, and aspects of Desolation Wilderness. This hike is ideal for athletic people looking for a heart-pumping workout (with lots of great views), but don’t have the time for a more sustained trail such as the ones to Mount Tallac or Freel Peak. Click on the above map to enlarge it for better viewing and printing. This map is only for reference and shows the general route to Maggie’s Peaks (South Peak). Always carry a traditional topographic map and compass when traveling in the backcountry. Please note that the “start” and “stop” icons are reversed as I started my GPS watch from the top and hiked downhill to record a cleaner route (than my hike up in the dark of the morning). Directly across the road from Inspiration Point (overlooking Emerald Bay on its south side) on SR 89, is the Bayview Campground. Drive through the campground to the very back and you will find the designated day-use parking area for the Maggie’s Peaks trailhead (as well as for the trail to Cascade Falls). The parking is free, but limited. Since the Bayview Campground is essentially at Emerald Bay, you need to arrive early for one of the Maggie’s Peaks trailhead parking spots, especially during summer weekends and holidays. If the day-use parking area in Bayview Campground is filled or you want to access this trailhead in the off-season (the gate to the campground is locked during winter months), you can park on the side of SR 89. However, don’t block the gate or park in a way that impedes traffic on SR 89, and be sensible about how you park so that other hikers can find a parking spot. If you arrive at the Bayview Campground during a busy day (weekends) or hour (after noon), be aware of your surroundings and take care when maneuvering your vehicle around the area. All the parking spots get filled up quickly and this finite zone becomes highly congested and, therefore, dangerous for pedestrians and moving vehicles alike. The trailhead to Maggie’s Peaks is at the very back of the Bayview Campground. Here’s a map to help you find the Bayview Campground and Trailhead. Maggie’s Peaks is located within the boundary of Desolation Wilderness. At the back of the day-use parking area you’ll find a message board with day passes for access into Desolation Wilderness. 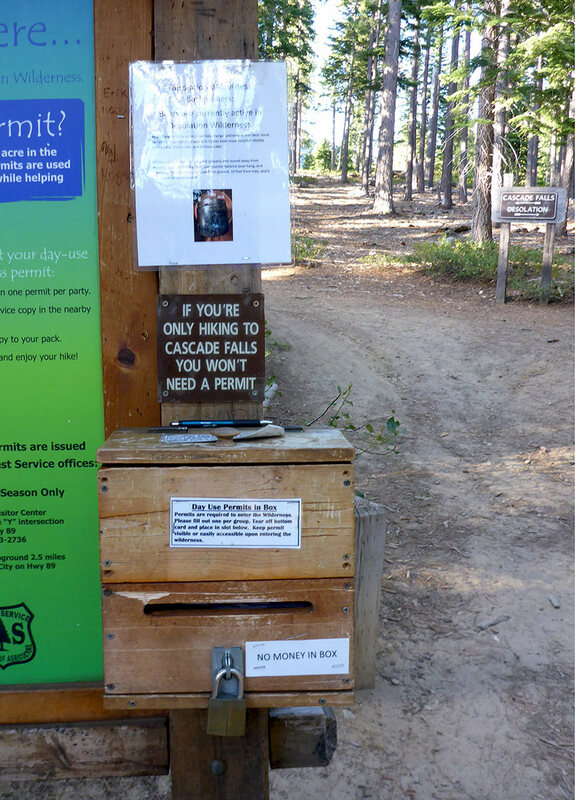 Fill out the day pass before stepping onto the trail. Directly behind the message board is the trailhead to Maggie’s Peaks. 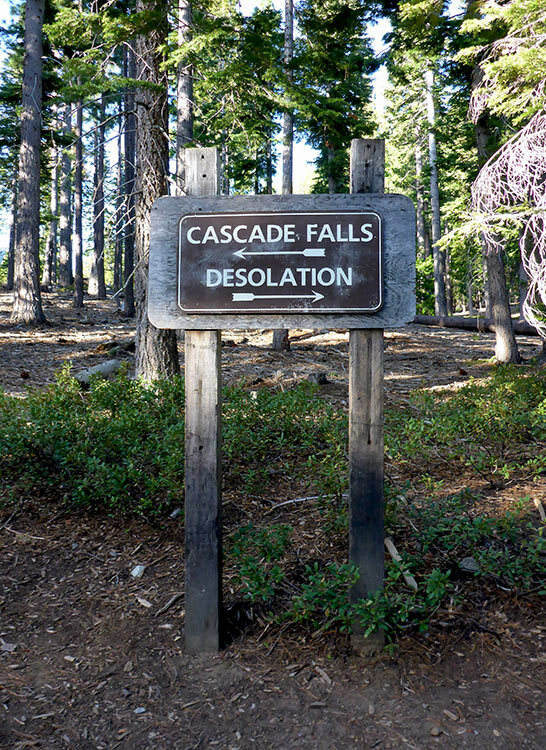 The sign indicates that hiking to the left will take you to Cascade Falls, so take a right at the sign (Desolation) in order to hike to Maggie’s Peaks. Although the distance of the trail to the south peak of Maggie’s Peaks is relatively short at just over two miles, the elevation gain is significant. You will essentially be traveling uphill the entire hike. The payoff (beyond the great workout!) is the incredible views for much of the hike, particularly when you actually reach your end destination of the south peak. Even before you reach the halfway point of Granite Lake, however, you will be treated to stunning views looking into and beyond Emerald Bay. This location is just over a half of a mile up the trail, but you have to hike approximately 500 feet of elevation gain. It’s definitely worth just hiking here to catch a sunrise, then returning to your vehicle and carrying on with your day if you’re very short on time. At about one mile you’ll reach Granite Lake, which is a great place to take a breather, but know that you still have a lot of elevation gain to negotiate. You’ll know you’ve reached the saddle between the north and south peak of Maggie’s Peaks when you come upon the views looking west into Desolation Wilderness. At this point there’s no established trails that lead to Maggie’s south peak. So, it’s up to you if you want to hike more directly uphill or if you want to take a more gradual route. For the direct line you’ll want to just start heading south from that saddle and continue hiking uphill until you reach the top. Otherwise, you can hike the established trail (that leads further into Desolation Wilderness) and eventually just start to head south and uphill (again, until you reach the highest point). This is not as challenging as you may think because you’ll be hiking through open forest for the most part. And, you’ll obviously know you’ve summited the south peak when you can’t hike any higher. There are massive granite boulders all around the summit. The upper sections of the trail (before you reach the saddle between the two peaks) can retain snow into June and July. During a hot afternoon this probably won’t present more of a hazard than getting your shoes sopping wet. However, if you try to summit for an early sunrise, you’ll most likely find yourself negotiating large patches of ice that are at steep angles. Take appropriate measures to avoid catastrophic falls. That may include carrying with you micro-spikes/crampons and an ice ax or simply hiking off-trail where there is no ice. I don’t advocate cutting switchbacks, but your life is your life. Be safe out there. Speaking of snow … the route to the south peak of Maggie’s Peaks is a fantastic snowshoe trek, particularly during the spring when the snowpack has stabilized. The route is essentially the same as the hiking trail, but you don’t have to strictly stick to the switchbacks once you reach Granite Lake. And, obviously, don’t walk too close to any of the edges once you reach the top. Under your weight, the cornices (overhanging ledges of snow) will crack and fall off and take you with them. Here’s a short panoramic video from the top of the south peak of Maggie’s Peaks to whet your appetite (from April 29, 2016).